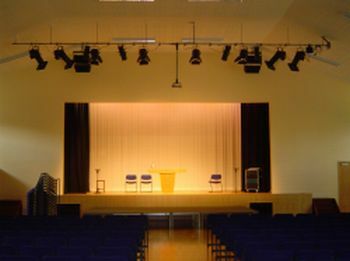 We provide a full site survey, supply and installation service for theatrical drapes and curtains to suit your venue. 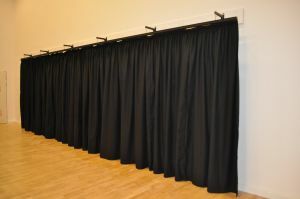 Ceiling, wall mounted and perimeter tracks - all curtains and tracks are priced on an individual basis. Please call us to discuss your requirements. 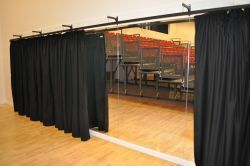 Our wall and ceiling mounted curtains are ideal for creating a perimeter "black box" environment in a drama studio, covering mirrors in a dance studio, as a full theatrical curtain on a stage or simply to provide a window blackout. Our easy to operate 2-way track system in either silver aluminium or black anodised finish can be surface mounted on a wall or secured to the ceiling. Our easy to use curtain system is generally intended for use where cording is not required, though we can of course offer this as well as electrically-operated tracks. 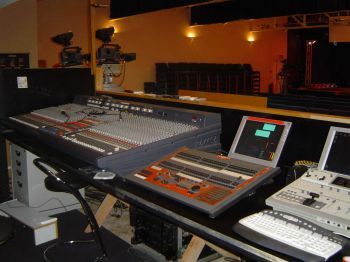 Whether it be for your Main Hall, Drama Studio or Theatre, let our experts help design and configure the most suitable performance lighting and sound systems for your requirements. Please do call us to see how we can help.